The data reveals that the Smart Home market has grown 95% between Q2/2016 and Q2/2017, reaching a quarterly revenue of $3.3B in Q2/2017 ($11.4B over the last 12 months). 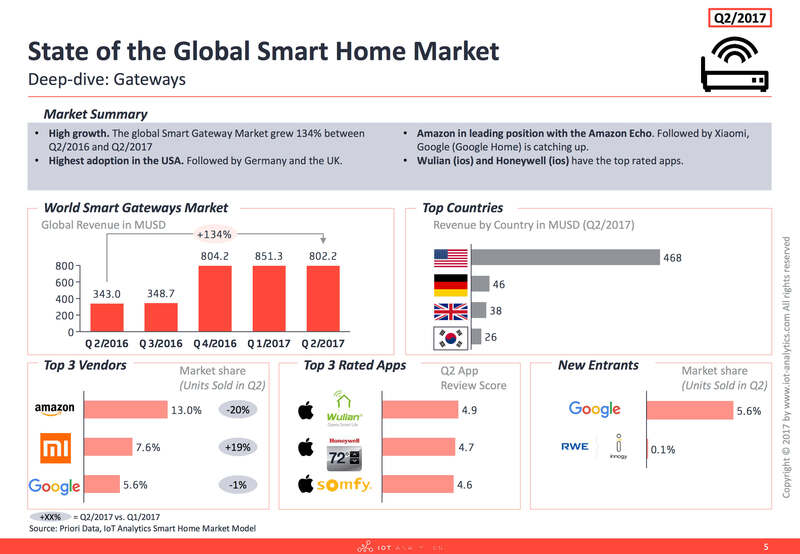 The United States currently make up almost 50% of global Smart Home revenue, followed by South Korea ($283M), Germany ($201M) and the UK ($184M). Further data sets are available Australia, Brazil, Canada, China, France, Japan and the Netherlands. Smart Home Gateways sold for an aggregated $802M in Q2/2017, making it the largest out of the 8 segments analyzed. Gateways also continue to outgrow the overall Smart Home Market due to fast adoption of voice-enabled home assistants such as Amazon Echo and Google Home. Appliances ($646M in Q2/2017), however, remain the fastest growing segment at 349% growth yoy, driven by a technology push of the South Korean manufacturers LG and Samsung. The other segments analyzed are Speakers ($733M), Security Systems ($724M), Thermostats ($218), Lighting ($101), Outlets & Switches ($32M), and Smoke Detectors ($17M). The comprehensive Market Tracker includes data on 205 Smart Home device manufacturers across 8 different home automation segments. The enterprise premium version of the database consists of 176 different data views (for more information see Appendix below). It grants insights into each company’s monthly unit sales and revenue figures from September 2014 to August 2017 globally and by country. The Market Model is largely based on granular app economy data provided by IoT Analytics’ partner Priori Data. 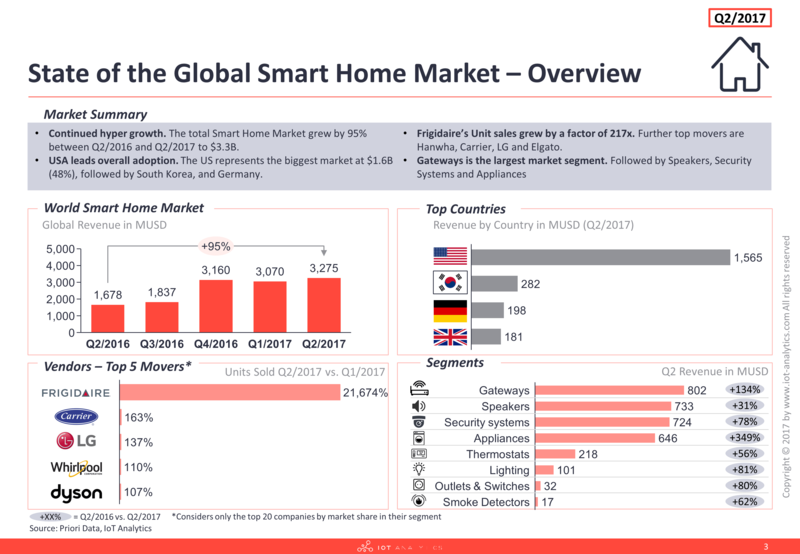 IoT Analytics put together the most relevant aggregate information to create a FREE 15-page report State of the Smart Home Market 2017 including a general view of the top countries, top segments, top market movers and top rated apps. Further insights into each segment and vendor market share can be found in the free report on the state of the smart home market HERE. The detailed monthly data can be purchased HERE. IoT Analytics is the leading provider of market insights & competitive intelligence for the Internet of Things (IoT), M2M, and Industry 4.0. The specialized data-driven research firm helps more than 40,000 Internet of Things decision-makers understand IoT markets every month. IoT Analytics tracks important data around the IoT ecosystem such as M&A activity, Startup funding, company projects, use cases and latest developments. Product offerings include in-depth market reports, technical whitepapers, sponsored research, regular newsletter, as well as Go2Market and consulting services. As a research pioneer, IoT Analytics combines traditional methods of market research such as interviews and surveys with state-of-the art web-mining tools to generate high-caliber insights. IoT Analytics is headquartered in Hamburg, Germany.